Veer Surendra Sai Institute for Mentally Handicapped (VSS) is the only Non Profit Organisation functioning in Sambalpur district, Orissa, catering to children who are Mentally Challenged, suffering from Autism, Cerebral Palsy and Multiple Disabilities. Unleashing hidden talent possessed by children with different abilities and equipping them with right self-help skills; thus making them self-reliant and socially acceptable is the mission of this organization. In recognition of VSS’s effort, The National Trust an autonomous organization of the Ministry of Social Justice and Empowerment, a Government of India body mandated VSS to train more children under the schemes ‘Samarth’ & ‘Aspiration Day Care’. Samarth is designed to offer vocational training and rehabilitation to youth above 18 years of age and Aspiration Day Care is an early intervention program crafted for children between age group of 5-8 years. VSS earned total income of Rs0.34mn in FY13 of which selling their own produce contributed 27%, gathering fees from beneficiaries and life members (25%) and from The National Trust in the form of Grants (24%). Individual donations collected from parents and localities contributed 20% of total income (Refer Fig. 1). VSS has performed better than NPOs in this space (listed with us) by posting highest ‘Total Direct Program Expenses’ of 91% in FY13. In FY12 Direct Program Expenses was 94%, as against sector average of approximately 70%. VSS scores better than other NPOs in this space by maintaining relatively lower staff cost (program related) of 31% in FY13. The staff costs was 35% in FY12 as against sector average of approximately 44%. This is an impressive indicator which highlights that despite the crunch on the receipt side, VSS has managed to keep the staff bills low and continue to deliver its programs (Refer Fig. 2). The Trust have been carrying forward fully depreciable assets like calculator, pen drive, blankets etc. since inception which is around 20% (Rs0.6mn) of total assets in FY13 which was Rs2.9mn. 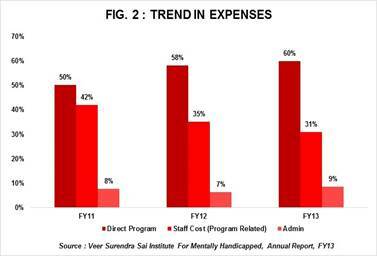 Self Sufficiency Ratio which measures ability of own income to meet the operating as well as program expenses remained stagnant at 32% even in FY13; viz., lower than sector average of 52% for the same period (sector average includes NGOs listed with us in Disabled space). Income growth dropped sharply by 57% in FY13, posting a negative 3 Year CAGR of 35% for the period FY11-FY13. Despite the drop in total income being witnessed y-o-y since FY11, VSS continues to receive donations from its largest donor – The National Trust; signifying trust and comfort in the modus operandi of VSS. Although the Founder have been infusing own funds since FY11 to run the operations, the deficit on a y-o-y basis since FY11 remains a matter of concern. Consistent demand for products produced by children (Refer Fig. 1) and willingness of a buyer to continue paying for these products justifies the quality of training imparted by the staff and volunteers at VSS. 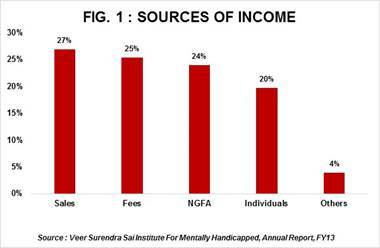 VSS is the only NGO in this space having earned significant income through this source in FY13. Active involvement of parents in designing and participating in execution of vocational programs is praiseworthy which binds together the execution and the management team during tough times. Lack of funds is restricting VSS to initiate fund raising activities. Failure to take marketing initiatives has kept VSS off the donors list due to its poor visibility. This is evident from VSS’s handful list of donors and declining trend of donations. Recruiting trained human resources willing to work in the social sector. With limited staff / trainers on field, VSS is unable to cater to all beneficiaries together; thus restricting VSS to induct more children. VSS is chaired by the District Magistrate and Collector. Among other personalities, Board also includes parents of children enrolled with VSS. The Board Members meet quarterly. The Founder and Principal is involved in the daily operations of the Trust. An Annual activity report is published summarizing the list of activities / programs held during the financial year.